Potential Irish international Nathan Redmond. MICK MCCARTHY’S RECRUITING of English-born players eligible for Ireland has hit a series of snags ahead of the opening Euro 2020 qualifier against Gibraltar next month. With Declan Rice officially gone the other way, McCarthy has been aiming to recruit a trio of players who came through the English system: Southampton winger Nathan Redmond, Leeds forward Patrick Bamford, and Ipswich striker Will Keane. None will be available to be selected in McCarthy’s squad for the March double-header against Gibraltar and Georgia, however. Redmond has yet to commit to Ireland, with McCarthy speculating that he may yet hold hopes of being capped again by England. 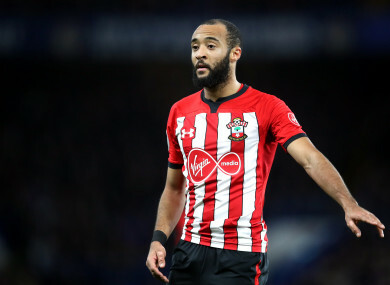 Redmond, who qualifies for Ireland through his mother, has played for England at underage level and once at senior level, albeit in a friendly game, meaning he is still eligible to swap allegiance. “I’ve spoken to his agent”, McCarthy told The42. ”I’ve tried to meet up with him and it’s not been successful yet. “He has already played with England, hasn’t he? McCarthy declined to rate the chances of Redmond declaring for Ireland. “I couldn’t put a percentage on that. I don’t know. Elsewhere, McCarthy is still waiting to sit down with Bamford. “Yeah, I’m waiting for a call from him. We have had a litany of messages with him, to try and arrange to meet for a coffee and a chat with him and his Dad: then he was injured, a game got cancelled. He played and scored for Leeds on Saturday and he played the other night too. I’m waiting for him now to say, ‘look come and meet me’ and I’ll drive to wherever that is and we’ll get things sorted out. Will Keane, meanwhile, has agreed to play for Ireland but the paperwork involving the transfer has yet to be completed. Even if if is all processed in time for the March games, Keane would likely miss them through the hamstring injury picked up against Wigan last Saturday. “That was a straightforward one. I rang him up, [he said] ‘Yeah, I’d love to’. He’s started the process [of transferring] and he is in that process now, but he’s sadly out injured. It means that McCarthy will largely draw on a similar pool of players as Martin O’Neill picked for the Uefa Nations League, although Sheffield United’s David McGoldrick will almost certainly come back into the reckoning. McCarthy says the striker is playing “exceptionally well”, having scored 11 goals in 33 games this season. Daryl Murphy may also be involved, having announced his retirement from international football under Martin O’Neill. He is now working with O’Neill again at Nottingham Forest, and McCarthy says the striker has left the door open for a potential return. The manager also name-checked Alan Judge, Sean Maguire, Callum O’Dowda, and Enda Stevens as players with whom he has been impressed over recent weeks. Elsewhere, the fact James McCarthy has yet to make a senior appearance for Everton this season – although he has sufficiently recovered from his broken leg to feature on the bench five times since January – means he may not be involved in next month’s squad. “I know that wasn’t going to happen because Everton aren’t going to send him there and devalue him but had he gone to a West Brom or a Derby or a Leeds or somebody who wanted a midfield player of his ilk, just to get games, it wouldn’t bother me where he’s playing because he’s just a really good footballer. “It’s hard to pick somebody who’s not played, no matter how good a footballer they are. Certainly in the first eleven but even in the squad. McCarthy faces another Premier League-shaped conundrum, given that two of his best players – Matt Doherty and Seamus Coleman – play in broadly similar positions. When asked if he could fit both players into the same team, McCarthy wasn’t in the mood to give much away. “I might play the Doc [Doherty] tucked in or wide-right, I might not as well. How am I going to solve that conundrum? Well I’m going to pick one of them and then I’m going to come in here and talk to all you guys [reporters] about the one I haven’t picked. “How wonderful he is, how gifted he is, how he should have been playing….but he’s not because I’ve picked the other one. McCarthy also said that he has yet to decide on his captain, although says “there wouldn’t be any reason” why he wouldn’t assign the role to Coleman. The Irish manager was at Richmond Park for the opening-night league game between Pat’s and Cork City, and says two players caught his eye. “Daire O’Connor. He was the one player who stood out for me. He played very very well I thought. Whether it was on the right or on the left, he went and played in behind the striker. He was the one that stood out. Ireland begin their Euro 2020 qualification campaign with a double header against Gibraltar and Georgia at the end of March. McCarthy is expected to announce his squad at the start of the month. Email “No imminent prospect of Nathan Redmond declaring for Ireland, says Mick McCarthy ”. Feedback on “No imminent prospect of Nathan Redmond declaring for Ireland, says Mick McCarthy ”.